If you’re looking for something a little more exclusive, here’s the tour for you. 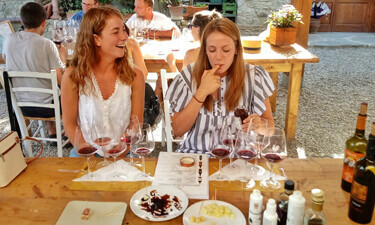 Enjoy the comfort of a private Tuscany wine tour from Florence with pick up from your doorstep. Travel will be in a recent model minivan with AC all for yourselves, and your wine tastings will be seated and personalized. There will also be ample time for your holiday snapshots, and contemplating the iconic Tuscan scenery. The tour is open to anyone who enjoys wine. If you’re an old hand, this is where you’ll find the expertise you’re looking for, but you’re at the beginning of your wine adventure, don’t worry. It will be my duty and pleasure to guide you into the world of Chianti & Super Tuscan wines. Though this is one of my premium tours, I assure you there will be zero hype just 100% enjoyment. I’ve designed the tour around family estates that differ in size and style. One is of medium size, while the other is one of the smallest in the region. 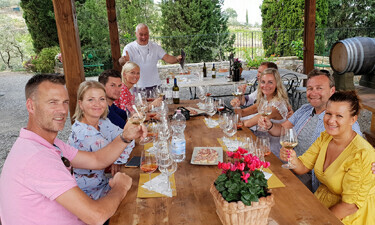 I guarantee a fun and welcoming experience at each estate, with a representative tasting of Chianti and Super Tuscan wines. You will be comfortably seated, your visits are personalized and will last about an hour and a half. As an added bonus we also get to taste genuine olive oil…not the junk that’s sold in supermarkets. 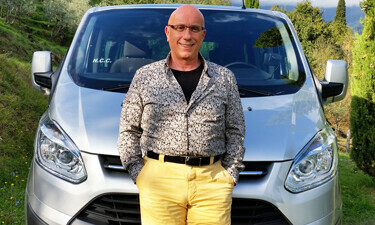 I’ve been doing Tuscany wine tours for fourteen years, and I’ve carefully chosen the wineries I visit over this time. The estates I prefer are those that offer quality wines at prices that are not inflated by fame. The feedback and satisfaction of my guests, has also been a deciding factor when choosing my venues. We’ll be travelling through some of the world’s most beautiful countryside, and I know you’ll want to contemplate the scenery and take a photo or two. My tours aren’t “just” about wine, so and I’ll give you ample time to enjoy every turn of the meandering roads. We’ll make a number of throughout the day. 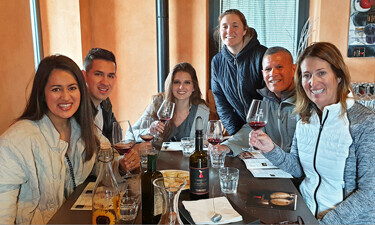 Your private Tuscany wine tour from Florence will include a light lunch at my favorite restaurant or at Castellinuzza winery. These are the venues where I eat at myself when I visit Chianti with my wife. Yes even though I work in Chianti, I love the place so much I bring my wife on my day off. Your meal will include a plate of appetizers, a pasta dish, a glass of house wine and coffee. 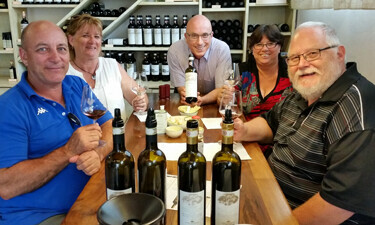 The leisurely pace of my Tuscany wine tours, means we often run a little late. However if there’s time we sometimes close our day with a short visit to the tiny town of Greve in Chianti. You can stroll the arched sidewalks and browse the shops which specialize in souvenirs. As a rule of thumb, your private Tuscany wine tour from Florence will start out at 09:15 am and you’ll be dropped of at approx 05:15 pm. Of course the service is door to door. A private vineyard tour in Tuscany isn't about about reaching the next destination, but enjoying the journey as an experience in itself. The beauty of Tuscany has much to do with nature, but man has improved what nature gave. It was during the renaissance that a new philosophy of combining farming with landscaping was conceived, and the concept still exists today. This is where you'll find some of the world's most breathtaking scenery, making each turn of the meandering roads a new and vibrant experience.